My 7 year old son drew and then colored this picture. 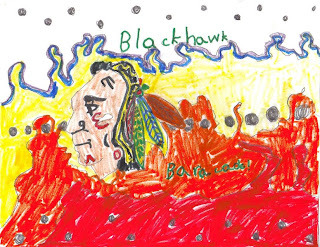 He did not trace the Blackhawks logo. He did have a printed out copy that he looked at while drawing his version. I personally think he did an awesome job, and I do not think it is because I am his father and am proud of everything he does. He really did a great job. In fact, everyone who has seen the picture in person is extremely impressed, even our new neighbor across the street who tragically is another one of those Red-Wing fans. Honestly, his drawing talent is somewhat of a mystery. It certainly is not genetic as neither I nor my wife would have been able to do this. So, this past weekend, we tried the Mr. Root Beer that we mixed up the previous weekend. It was good. It was really really good. If you like root beer, you would really like this stuff. I think even if you do not like the mass-produced-soda-company root beers, you may like this one. It is much more flavorful. It is just better than most root beers. I cannot get Connor to try it. He tells me he does not like root beer. The boy has never tasted root beer. Connor quite frequently says he does not like various foods. Usually, this is before he tries the food. I sort of want him to try the root beer, but not enough to try real hard to convince him. Root beer is, after all, mostly sugar water. But, we shared with some people we had over on Saturday for grilled brats and burgers. Everyone who tried it thought it was just awesome. So, the root beer was a success. Too bad the boys do not quite appreciate what good stuff they made. But, maybe that is a good thing. As I mentioned, root beer is mostly sugar water. My boys and I mixed up some Mr. Root Beer this weekend. My dad sent us a Mr. Root Beer kit awhile back. We tried to make our first batch back then, but somehow one of the kids (Connor would be my guess) misplaced the actual Root Beer Flavoring bottle. We did not discover this until it was time to add it, and we ended up trying to make it without the root beer flavor. It turned out pretty bad. Basically, root beer without the extract is white sugar and brown sugar water. As it turns out, the extract is the worst part to lose, because the kit came with 2 of everything EXCEPT the extract bottle (one bottle of extract is good for 2 batches). Since then, I ordered a refill, and we finally got around to "brewing" another root beer batch, this time with the actual Root Beer Flavoring. Carbonation involves a little wine yeast for a couple of days (which means our root beer will have a little alcohol in it, but not much I think). Today, we felt the plastic bottles and decided that they were hard enough to indicate a good amount of carbonation, so we put them in the fridge. We will probably chill them until this weekend and see how home-made Root Beer (with actual Root Beer Flavoring) tastes. I meant to go camping Memorial Day Weekend, but waited too long to get a decent reservation. Back before kids, that would not matter, but now-a-days, I do not trust being able to just find a first - come - first - serve campsite. So, we decided to wait until the weekend after Memorial Day Weekend to do our camping. As it turned out, my procrastination was a good thing. The weather was much better when we went than it was over the Memorial Day weekend. Just another example of my Semi-Charmed kind of life. Our camping trip was to Rocky Mountain Nation Park. Again. We had alot of fun. I really liked the campsite we got this time, and will try to get this one or one of them real close next time we come here. Isn't the picture of the hugging boys cute? It makes Daddy happy to see the boys get along. Anyway, I hope you like the pictures. It was really pretty up there, and the pictures really don't do it justice. As I type this, I just finished watching the Pens beat the evil Red-Wings to force a game seven. As it turns out, I will not be able to watch game seven live, so don't tell me what happens. I'm sort of watching Magic vs. Lakers right now too. Hockey is so much more exciting to watch than basketball. I really don't understand why hockey is not a more popular T.V. sport here in America. Anyway. Go Pens. Sorry I can't help them out Friday. I'll do what I can through the DVR on Sunday. This has to be the best commercial I've ever seen. I wonder who had to go through and find all these pictures.